David Ascher (from left) and John Kennedy, based in the Division’s Field Engineering Office in Norfolk, are retiring as heads of the Miniature Microminiature/Module Test and Repair Program. The MTR Program has saved more than $700 million for the Navy and other services since its inception in FY96. Code 25 hosted a brief by members of Division Newport’s Detachment (Det.) Field Engineering Office Norfolk on the Miniature Microminiature (2M)/Module Test and Repair (MTR) Program in Chafee Auditorium on March 24. David Ascher and John Kennedy head this vital program that has saved the Navy and other services more than half a billion dollars since its inception. Capt. Howard Goldman introduced the speakers and noted the high interest this program has from NAVSEA. The MTR Program’s foundation is built upon what is known as Gold Disk diagnostic test routines. Gold Disks are used by technicians throughout the Navy and DOD for on-site diagnosis of circuit card assemblies (CCA) and electronic modules (EM) for repair using 2M and MTR equipment. There are currently more than 7,000 Gold Disk test routines, which are distributed quarterly on DVD to Navy and DOD commands. As a diagnostic troubleshooting tool, each Gold Disk enables a technician to identify the faulty components on CCAs or electronic modules. The same technology may also be used to determine whether an assembly is “No Fault Evident.” The primary purpose of a Gold Disk is to provide the technician with all the necessary information to identify component-level failures and complete the necessary repairs. The diagnostic enhancement and organic repair capability reduce repair costs and improve fleet readiness. Thanks to this program, CCA/EM repairs are accomplished at the lowest practical maintenance level, thereby offsetting activity costs associated with OEM/depot repair. Under OPNAV and NAVSEA guidance, the MTR Program develops and provides electrical/electronic module test and repair capabilities to organizational and intermediate maintenance facilities for both ashore and afloat commands. 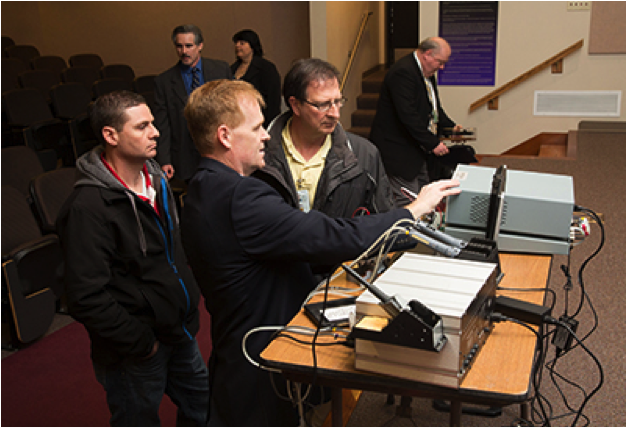 A brief and demonstration of the Miniature Microminiature/Module Test and Repair Program, which allows Sailors to effect repairs on their own systems, was hosted by Code 25 in Chafee Auditorium in late March. “It is a non-destructive diagnostic testing that identifies failures down to the component level,” said Ascher. As the in-service engineering agent (ISEA) lead for MTR equipment, Ascher, Kennedy, and the engineers and technicians at Det. Norfolk develop the technical manuals and the Gold Disks for circuit card assemblies, they certify Gold Disk developers and developer sites, they provide guidance for the maintenance and operation of MTR facilities, and they supply the technical assistance for all aspects of the MTR program. Det. Norfolk is also the Gold Disk verification agent for all DOD activities and the depot for the AN/USM-674 tester. The 2M ISEA is located at the Naval Surface Warfare Center Crane; the MTR ISEA is at Det. Norfolk. “We had to be near the fleet in Norfolk,” said Ascher. The program began in 1975 as a National Aeronautics and Space Administration (NASA) program and now 2M/MTR is the standard maintenance process for circuit card and electronics testing and repair and is essential for maintaining a ship’s combat readiness. The current MTR tester, known as the “AN/USM-674,” is on its way to becoming obsolete. The next generation of tester, the “AN/USM-726,” is expected to be out in the fleet in FY17. This will require some additional training on the upgraded tester. A 2M MTR workstation includes a computer, a computer-controlled analog signature analysis tester, a soldering station, a microscope, tools, and other specialized equipment and accessories designed for CCA and EM fault diagnosis and repairs. There are two work benches: one for testing and one for repair. The tester, its components, and parts are not available commercially; it is a strictly Navy-managed product. Because of space limitations, the workstation is not installed on fast attack submarines but is installed in modified form on SSBNs and SSGNs. Thanks to the 2M MTR work station developed for this program, which includes a computer, a computer-controlled analog signature analysis tester, a soldering station, a microscope, tools, and other specialized equipment, repairs of circuit card assemblies and electronic modules are accomplished at the lowest practical maintenance level, thereby offsetting activity costs associated with OEM/depot repair. The program also offers the MTR Tracking System, which provides technicians and supervisors with the ability to track documents and generate reports on all maintenance actions related to faults and resolutions. The program provides quarterly metrics reporting on fleet savings as well as a database of every circuit card that has failed, what failed on it, and which component fails the most. These reports are provided to the type commanders, Shore Immediate Supervisor In Command, NAVSEA Maintenance Engineering Division, Office of the Chief of Naval Operations, U.S. Fleet Forces Command, Commander Pacific Fleet, and 2M MTR commands. The reports contain all the metrics and savings of the program. For example, in FY14, the program yielded $37,163,983 in cost avoidance, with 8,367 repairs and 564 casualty reports averted. Since the program began in FY96, the cost avoidance for the Navy is $679.49 million, with the total program funding for that period at $70.83 million. The return on investment since FY96 is $608.66 million. Additional benefits include a reduction in turnaround times and increased readiness. The program, which is constantly evolving to meet Navy needs, has annual funding of approximately $5 million. In service to the fleet, the Gold Disk program improves the readiness and sustainability of ship and shore systems and their components. It also reduces the number of technical assists allowing Sailors to effect repairs on their own systems and, as such, improves their quality of life because their work is not delayed as they wait for outside assistance. Huntron Workstation 4.3 replaces Huntron Workstation version 3.5.2. The Huntron Workstations 4.3 software is the keystone of the MTR Gold Disk software suite and ensures backwards compatibility and seamless migration from old to new operating systems. Huntron Workstation is recognized as the standard for power-off debugging and troubleshooting of printed circuit cards. The organized systematic approach of the Huntron Workstation software provides a multiple pane layout that allows for rapid test creation, quick viewing of component signatures and seamless support of other Gold Disk actions (parts tracking, labor reporting…). The Huntron Tracker Model 32 will be an integral part of the AN/USM-726(V) which is replacing the AN/USM 674(V) which uses the ProTrack Model 20B with ProTrack Scanner I. The Huntron Model 32 features variable range parameters resulting in hundreds of voltage, source resistance and frequency combinations. The Tracker Model 32 uses a color touch screen LCD for control of features such as range configuration, front panel pin selection and Channel A/B settings. The Huntron Tracker Model 32 LCD delivers a very fast screen refresh rate for quick screening of component pins and display of the A and B channel signatures at the same time (A+B mode). The built-in pulse generator enables you to dynamically test gated devices such as SCRs, TRIACs and relays. It features two 64 pin IDC connectors for use with IC clips or custom cable interfaces.